Blood Work is an abstract meditation on the desire for “blood,” real or imagined, within the horror film genre. 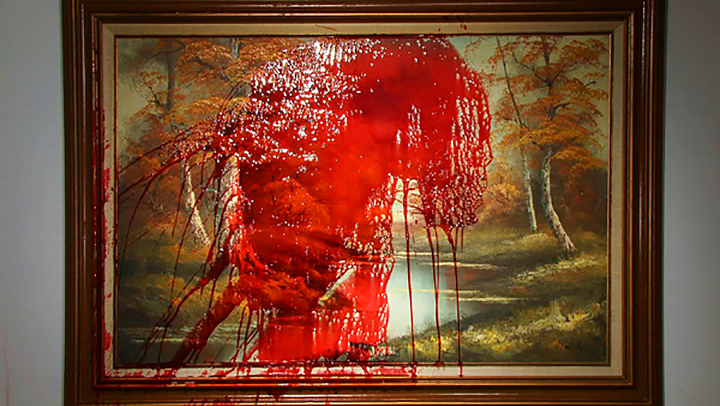 The video playfully narrows the mise-en-scène of the horror genre through the absence of the body, or victim, and the exaggeration of sound and editing. Blood Work isolates props in the studio and creates a visceral corporeal presence through the animation of fake blood. Visually, the video alternates between shots of a messy stagehand that helps the video’s main character, "blood," splash, drip and ooze. Working within the conventions and clichés of the genre, the video and soundtrack combine to question off-screen space and the mechanization of illusion.